Successfully Added Wireless Baby Monitor Set (Night Vision, AV OUT) to your Shopping Cart. Relax with confidence while your baby rests. This Wireless Baby Monitor Set provides additional eyes and ears to watch over the little one while you go and do the things you love/need to. This multi-function Baby Monitor allows parents to see, as well as hear, their baby and is ideal for check-ups without waking him or her. The portable design makes it easy to take with you around the house and giving you the freedom to watch TV, listen to music, entertain guests, do household chores, exercise, or sleep with the assurance that you'll always know when your baby needs you. 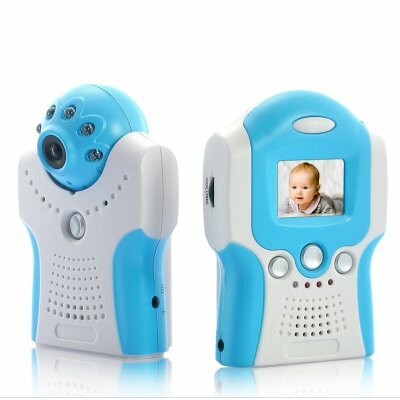 Other features include IR lights for night vision as well as a microphone near the camera, allowing you to hear the baby when they start crying for mommy and daddy. This wireless baby monitor set is easy to use and requires no installation. Just place the camera in view of your baby's area, pick up the wireless receiver, and start spending less time worrying and more time relaxing. An AV output is also available for connection to your television, so you can see everything on your large screen TV while going about your business. Keep an eye on your baby wherever you are. If have friends or family with a baby (or one on the way), this baby monitor also makes for the perfect gift to show them you care. This Wireless Baby Monitor Set is in stock now and available at a parent-friendly price from your best source of high-quality, factory-direct electronics: Chinavasion.